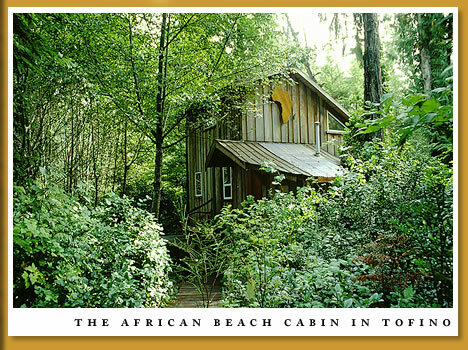 The African Beach B&B is a cozy, private cabin on Lynn Road outside Tofino in Canada. Mere steps from the expanse of Chesterman Beach, the African Beach is located in one of Canada's few open ocean beach communities. Accessed by a curving boardwalk that leads through thick cedar-and-salal forest, the African Beach includes a downstairs living area with a dining table and a double hide-a-bed, an all-equipped kitchen with a refrigerator and a gas stove, and a bathroom with full shower. From the main level, a curving staircase leads to the cabin's open-concept loft bedroom. Stylish and tranquil, built with local woods and fibres, the African Beach is an ideal base location for exploring and enjoying the Tofino area's forests and coastlines. The cottage also includes an outdoor sun patio and an outdoor shower, and gourmet breakfasts are served each morning at a time of our guests' choosing. It is a place that, for a few days, can be entirely one's own, a home away from home on the Canadian Raincoast. Rates are based on double occupancy. Additional guests over 15 years of age (for a total of up to four) are $20 per night. All rates are in Canadian Dollars.